This article is about the Order of the Norwegian Lion. For other uses, see Order of the Lion. 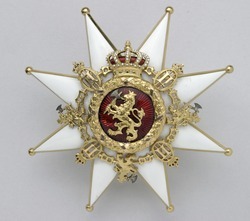 The Order of the Norwegian Lion was a Norwegian order of knighthood established by King Oscar II on 21 January 1904, "in memory of the glorious events associated with Norway’s venerable Coat of Arms". The order was established as an equivalent in rank to the Swedish Order of the Seraphim as knights of the Norwegian Order of St. Olav ranked below the knights of the Seraphim in the shared Swedish-Norwegian royal court. However the expansion of the Norwegian honours system received mixed reactions amongst Norwegian politicians. King Haakon VII formally became Grand Master on 18 November 1905, but never wore any of the order's insignias.